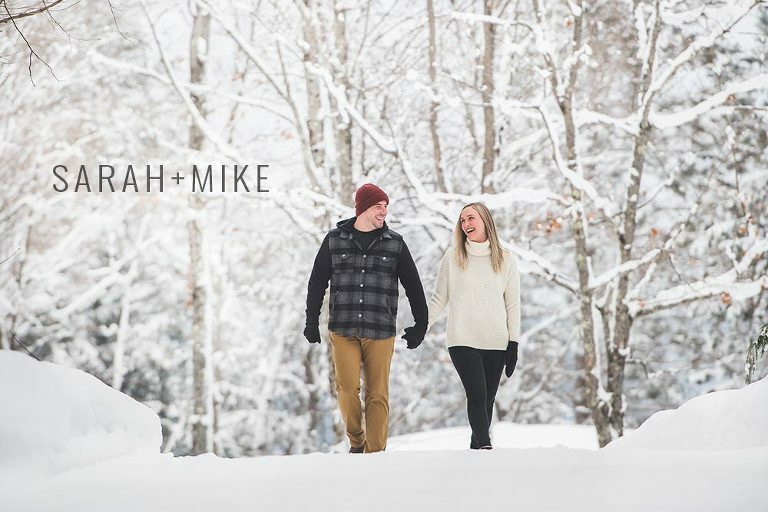 The timing was perfect for Sarah and Mike’s cottage engagement session up in Muskoka… we’d had days of fresh snow falling and everything looked like something out of a classic Christmas novel. Sarah has grown up spending time at their family cottage so it just made sense to have their engagement photos done there. The two of them also share a love for hockey so when they asked if we could do some photos centered around hockey I was obviously all-in on that! The snow was a little too deep on the lake to shovel off to get a little one on one game going so instead we grabbed a couple beer, muskoka chairs and trudged out into the middle of the lake. You know, to keep it Canadian-like. We met at a bar downtown a little over 4 years ago. Kinda funny since we now avoid both bars and the city like the plague! Sarah: We met up on neutral ground in the quaint little area of Markham called Unionville which was about halfway between Aurora (where I grew up) and Whitby (where Mike grew up). I remember three things when we greeted each other in the parking lot 1) I liked the green Under Armour coat he was wearing (style points) 2) He was taller than I remembered (at 5’9 myself this was a bonus) and 3) He was clearly an athletic guy but he had a cute way of bouncing on his toes when he walked, almost like he was skipping along so excited to see what the night would bring. He didn’t seem nervous, just eager to get to know me. I’ve never told him these things so he’s going to get a kick out of reading this! Mike: I remember her being really easy to talk to, which made it feel comfortable right away. Almost like old friends catching up and not at all like a first date. As soon as the night was ending I remember thinking that I really wanted to see her again so I set up date #2 before we even said goodbye. Sarah: Hoping I will any day now! Just kidding. Spend 5 minutes with Mike and I and you’ll learn that 90% of our conversations involve teasing each other. In all honesty I knew he was exactly the type of guy I had always seen myself with pretty early on. He handles the ups and downs of life with a grace and strength that I am in awe of. Plus he’s pretty easy on the eyes. What can I say, when you know, you know. Ya know? Mike: It didn’t take long to realize Sarah was the person I wanted to marry. We went through a tough first year when I lost my mother. Sarah was always right by my side either to talk, listen or just be the support I needed. It was Christmas Eve and I was going in to work for a half day so I wanted to bring one of our dogs with me (we have 3 bulldogs!). Mike put up the biggest stink about me taking her to work and we actually argued about it in the morning, I remember thinking “what a grinch!”. Little did I know what he was up to. When I walked through the door at 1:00 he was down on one knee in our front hallway with each of the dogs sporting a heart shaped sign around their neck that spelled out “will you marry me?”. Smart man, he knows I can never say no to those dogs. Sarah: Coming home to Mike every night is like taking one big deep breath. He always keeps perspective. Whenever I get wrapped up in my own head he reminds me nicely that chances are I’m overthinking it (I always am). We share a lot of the same interests but our personalities are really different and he definitely brings a calmness to my life that I need. Mike: I love the fact that Sarah and myself share so much in common but can be so completely different. We can make a Saturday night in watching the leaf game just as fun as a night out. We balance each other out and I couldn’t ask for a better partner. Sarah: Having all our friends and family together in the same room for one big party!